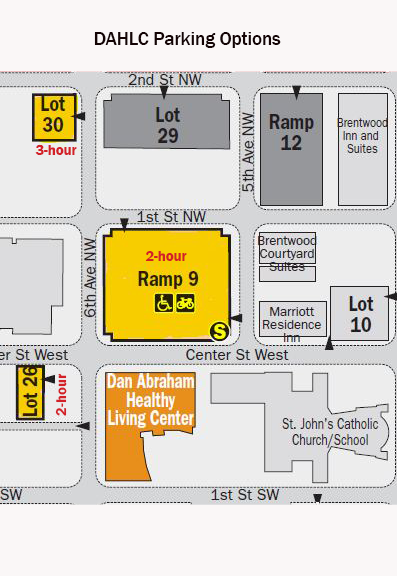 The Dan Abraham Healthy Living Center has three areas for member parking at the downtown facility. 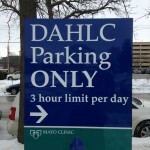 These parking spaces are for members to use while they are at the Healthy Living Center. The employee parking ramp (West Ramp #9) across Center St. from the Healthy Living Center has 2-hour spaces located just inside the gate on street level. Please use the 5th Ave NW entrance. On 6th Ave NW, there are two surface lots for member parking. Lot 26 contains 2-hour spaces. Lot 30 contains 3-hour spaces. Please pay close attention to the amount of time you're parked in these spaces. Overtime parking results in Mayo Parking & Transportation placing an immobilization boot on your vehicle. The cost to remove this boot is $65. If you're using a car that doesn't have your red heart parking tag on it, please give your license plate number to anyone working at the front desk as soon as you check in. Staff will notify Mayo Parking & Transportation that you are parking legally.